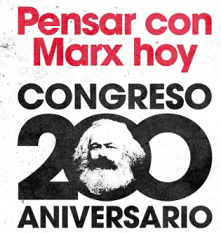 An International Conference on the 200th Anniversary of the Birth of Karl Marx will take place in Madrid, 4-6 October 2018. Please send proposals for communications by 1 May. Coordination: Heriberto Cairo, Professor of Political Science and Sociology at the UCM; Jaime Pastor, Professor of Political Science at the UNED; Eduardo Sánchez, Professor of Political Science at the UCM. Coordination: Rafael Escudero, Professor of Philosophy of law at the Carlos III University of Madrid. Antonio Baylos, Professor of Law at the UCLM; Carlos Berzosa, former Dean of the UCM and Emeritus Professor of Economics at the UCM; Juan Ramón Capella, Emeritus Professor of Law at the UB; Juan José Castillo, Emeritus Professor of Sociology at the UCM; Alicia Durán, Researcher at the CSIC and member of the Dean´s Council of the CSIC; Josep Fontana, Professor of History at the UPF; Montserrat Galcerán, Emeritus Professor of Philosophy at the UCM; Elena Hernández Sandoica, Professor of History at the UCM; Florencio Jiménez Burillo, Emeritus Professor of Psychology at the UCM; Pedro Marset, Emeritus Professor of Medicine at the UM; José Luis Martín Ramos, Professor of History at the UAB; Román Reyes, Emeritus Professor of Sociology at the UCM; Juaquín Sempere, Professor of Sociology at the UB; Juan Trías, Emeritus Professor of Political Science and Sociology at the UCM. Jaime Aja (UCO), Teresa Arenillas (FIM), David Becerra (Universidad Catholique de Louvain), Ignacio Castien (UCM), Enrique Díez (UL), Carmen Domínguez (UCM), Marga Ferré (FEC), Fernando Harto de Vera (UCM), José Daniel Lacalle (FIM), Francisco José Martínez (UNED), Javier Moreno (UC3M), Juan Manuel Ramírez Cendrero (UCM), Eduardo Sánchez Iglesias (UCM), Francisco Sierra (US), Julián Sanz (UV). Place of the Congress: Universidad Complutense de Madrid (UCM). Formalization of registration and fees: All participants in the Congress as communicators must formalize their registration before 15 September. The registration fee is 50 euros teaching staff, 20 euros communication of students or researchers without income and 20 euros assistants with the right to a certificate. Bank transfer in favour of the FIM, ES68 0075 0446 410600021247. It offers the possibility – dependent confirmation – of validating the assistance for 2 ECTS credits at the Complutense University of Madrid (UCM).